Don't know what to watch next? We have a binder chock-full of ideas for you to flip through. You'll find it in our Feature Film section. On the Lower Level in the Children's Room there are thousands of great titles for families and kids of all ages. Travel DVDs are with the Travel books. Documentaries, exercise videos, nature specials and all sorts of other "non-fiction" DVDs are shelved along the stairwell near the Biography section. Great Courses on DVD can be found along the stairwell near the Cooking and Business book displays. Language learning DVDs are shelved together with the language learning books and CDs. English as a Second Language DVDs are shelved together with the books and CDs in the ESL collection. Level 1 has the library's feature films, TV shows, and foreign language movies on DVD. Check here for our the latest acquisitions. Level 2 has music concerts and performances on DVD as well as Russian and Chinese language DVDs. Can't find the DVD you want? We'll do our best to find it for you! Stop by the Reference Desk or get in touch with us. Even if we don't own the title you want, we'll try to get it from a library that does. We also happily take suggestions for purchase! Thousands of titles are available to borrow instantly, 24/7, through Hoopla Digital and Kanopy. Borrow one of the library's Roku devices to stream over 100 digital movies and TV shows on your home television. Dozens of movies are available to stream through OverDrive. 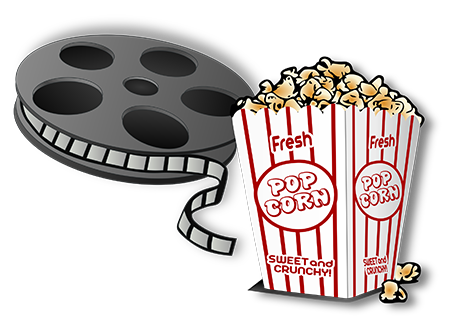 Come to the library to enjoy one of our movie screenings!